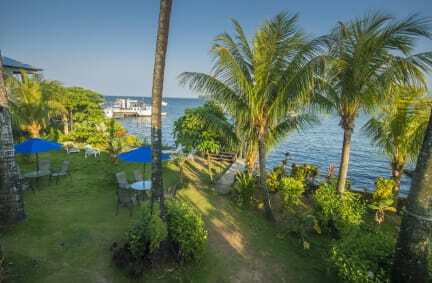 Casa Nostra, Livingston, Gwatemala : Rezerwuj teraz! We have the best rooms in Livingston for the price, the best food in town and the best view in town. 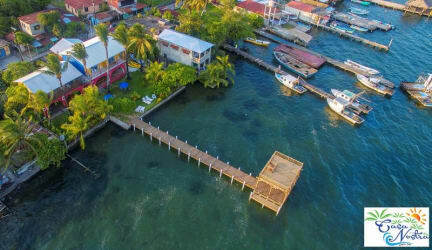 Newly renovated riverfront home, all bedrooms and suites have 2nd floor balconies overlooking the river, bay and mountains in the background and all have new orthopedic beds with a cool tropical breeze off the water at night. Our suites are beautiful sleep up to 4 and have air conditioning, ceiling fan, large private bath, tile floors, armoires and antique bedside table and large balcony with our famous view. We have a new 2 story dock, completed in 2017, that you can hang out in hammocks, sunbath upstairs or dive off and have a swim.